This spring I have been a research intern at the Dutch Institute for Art History in Florence for the Patrician Patronage Project. The project aims to research the artistic activities undertaken by Florentine patrician families between 1530 and 1670. Allocated to me were the Rinuccini, a family I had never heard of before, but of whom I now speak as “my family”. The Rinuccini came from Cona, a small village in the heart of the Chianti, just ten kilometres south of Florence. Their Villa Torre a Cona is surrounded by a breath-taking scenery of vineyards and olive groves (fig. 1). Today, it houses a wine estate, where we can experience all the good of the Rinuccini in liquid form (although it is no longer in their possession; the last male Rinuccini died in 1848). This Villa Torre a Cona turned out to be not only interesting for its Renaissance history (with details of a wedding feast that went on for three days; a beautiful Renaissance garden; a fantastic art collection that was housed there, etc. ), but also for its more recent history. When one thinks of the Second World War in Tuscany, one thinks of destruction, horror and atrocities. Large parts of the centre of Florence were bombed when the Germans retreated. How could it be that so much of the art works have survived? Many people will know the movie Monuments Men that came out in 2014. This movie is based on a book by Robert Edsel that focusses mainly on Northern Europe. Edsel’s latest book, Saving Italy, concerns the Monuments Men in Italy, Florence. They were responsible for saving so many of the artistic treasures of Western civilization. Works of art that still amaze us today. Works of art that were hidden in the Villa Torre a Cona. He found some of the most stunning works of Renaissance art: the terracotta reliefs by Luca della Robbia from the Pazzi Chapel, Donatello’s St. George made for the Orsanmichele, and artworks from the Duomo, but also Michelangelo’s Madonna della Scala, Battle of the Lapiths and Centaurs, as well as his sculptures for the Medici chapel. We can only guess what it would have been in those days to suddenly encounter so much beauty. The sculptures were hidden in the cellars, among crowbars and greasy cans of oil, where unexpectedly, Hartt recalled he was transfixed by the agonized face of Michelangelo’s Dawn. Fig. 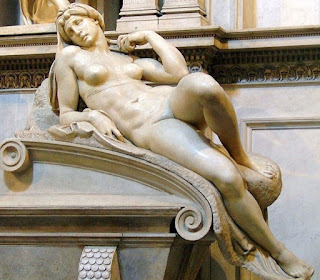 2 Michelangelo, Dawn, Medici Chapel. * Ilaria Dagnini Brey, The Venus Fixers: The Remarkable Story of the Allied Monuments Officers Who Saved Italy's Art During World War II (New York, 2010), p. 162.